Happy Book Birthday. All the experience you share about your writing process has been very helpful to me. I really like hearing what people do and how they do it…not rules, just seeing someone’s process gives me perspective. So thanks for that and the times you’ve answered questions for me. Also…thanks for the hard work on the book, I’m excited to read it. Yup. These are the trials that separate the real writers from those who just like the romantic idea of being a writer. It’s hard, hard, hard, hard work. But, if survived, also incredibly rewarding work. Congrats, great to read about your process. I find marketing the hardest thing to do, as I’m unassuming and hate to put myself out there, but it has to be done! 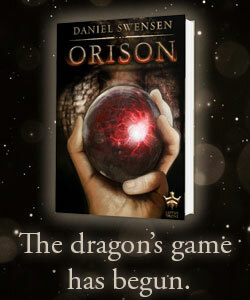 Looking forward to reading Orison! I’m glad I stumbled upon your blog. Fantasy & dystopia are not usually my area of interest in reading, but the fact that you combed through the manuscript so many times (something I can relate to) makes me want to read Orison. Can’t tell you how many books I want to toss through a window because of poor editing – both traditionally published (surprising number of these) and self-published. Thank you, Victoria. The other thing I’ve learned is that apparently no amount of editing can catch every typo,but we did the best we could!